Depending on where you go in Eastern Europe—which includes the Czech Republic, Bosnia, Serbia, Macedonia, Croatia, Poland, Hungary, Ukraine, Slovakia, Slovenia, Lithuania, Romania, and European Russia—the weather can be drastically different, especially in the winter. While northern countries often experience plenty of snow and colder temperatures, southern locales can stay warm well into the season. To prepare for winter travel to Eastern Europe, you can't just stuff some flip-flops in your backpack and hop on the next flight to Prague. You should instead do some careful planning before you travel to Eastern Europe during the winter. Consider what you'll take to protect you from the cold, what you'll do in case of a flight delay or cancellation, and what hotels will put you in a good position to catch public transportation when you'd rather not walk. Winters in the Czech Republic typically start around mid-November and warm up around the end of March and are known for being cold, icy, and wet with freezing temperatures happening frequently throughout the season. Temperatures typically fluctuate between a high of 50 F and a low of 10 F, depending on what part of the country you're visiting (plains versus mountains, north versus south). Additionally, Czech winters can be relatively unpredictable from year to year, with some winters lasting much longer or short than others. Snow and frost covers most of Bosnia in the winter months, though the southern plains of Mostar see significantly less freezing conditions due to its proximity to the Adriatic Sea. Still, Bosnia experiences a relatively mild winter compared with other Eastern European countries. However, with average temperatures remaining around freezing for most of the winter months, you should still bundle up if you plan to visit Bosnia, especially toward the middle of January when conditions are at their most extreme. Serbian winter weather typically starts around mid-November when temperatures drop below freezing for the first time of the season. On average, Serbia stayed at or below freezing most of the winter and receives plenty of snowfall all season long, making it a great destination for winter sports and activities. While some days will be cloudy or foggy and mildly cold, others will be even chillier due to Arctic and Russian fronts that blow down toward the Mediterranean throughout the season. The weather you'll experience in Croatia this winter largely depends on where you are in the country. While the Northern Plains region sees a harsher, colder winter with more snowfall, areas of Croatia along the Adriatic Coast experience milder temperatures and a relatively drier season; while you may need to bring a down jacket for inland destinations in Croatia, you may be able to enjoy a day outside along the coast in a light coat and sweater instead. Along the Baltic coast, you can expect near-freezing weather for most of the winter seasons (from December through February), with colder temperatures in the south and east of Poland. The capital city of Warsaw, which is located near the center of the country, keeps an average temperature of around 28 degrees Fahrenheit throughout most of the coldest month, January, and begins to warm up to a cool freezing by early March. Due to its continental climate, you can expect overcast skies, plenty of snowfall, and even a bit of mist and fog throughout the winter months in Hungary, a country entirely landlocked by Croatia, Serbia, Romania, Ukraine, Slovakia, and Austria. With temperatures ranging between 25 degrees Fahrenheit in Budapest in January to a high of 50 by the time March rolls around, the winter is fairly temperate and manageable for tourists, regardless of what part of the country you visit or during which winter month you plan your travel. During most of the winter, temperatures in Ukraine remain below freezing, except in the most sheltered areas of Crimea. The capital of Kiev is covered in snow most of the season, as is most of the country, but while you may experience bouts of extreme cold, temperatures throughout the majority of Ukraine remain at or around freezing throughout the winter. However, temperatures can drop below negative 22 degrees Fahrenheit if the Siberian Anticyclone moves over the country, which has been happening less frequently in recent years. Depending on where you go in Slovakia—Prosov in the east or the capital of Bratislava in the far west—the weather will be slightly different in this land-locked country, dropping significantly in the central mountains and rising steadily as you descend into the plains regions on both the east and west ends. Regardless of where you are, though, temperatures are expected to average at freezing or below for most of the winter months beginning in mid-November and lasting through mid-March. With cloudy skies and cold temperatures across the country, winter in Romania can get pretty brutal, especially in January and February when temperatures drop and snowfall can be quite common if not abundant. Temperatures remain around freezing, on average, throughout most of the country, but some regions at higher elevations may experience temperatures below 30 degrees Fahrenheit in January and February; plains cities like Bucharest and Gelati will be relatively warm compared to cities on the Transylvanian Plateau west of the Carpathians like Cluj-Napoca and Sibiu. With arctic and subarctic climates in the far north and continental and moderately continental climates throughout the rest of western Russia, the temperatures and weather conditions tend to fluctuate drastically depending on what part of the country you visit. However, the European side of Russia is much warmer than the Asian side of the country and is instead characterized by chronic instability in its weather due to its lacking of geographical features like mountain ranges that would block or trap the cold. There are plenty of good reasons to travel to Eastern Europe during the winter season, maybe most importantly, cost savings. However, less expensive airfare doesn't mean your trip will be less valuable. Follow the lead of the locals, and enjoy the nightlife, the performing arts, gorgeous winter landscapes, and holiday celebrations. Ice skating rinks are set up in historic centers, and the scent of hot mulled wine fills the air. Restaurants in Eastern Europe also become all the cozier for their warm atmospheres and hearty cuisines including filling soups, meat-stuffed dumplings, and decadent, layered pastries. If you plan to take advantage of the wintertime and holiday festivities, you'll want to plan ahead. Both cultural and performing arts festivals abound. For something special, celebrate Christmas, the New Year, or Valentine's Day at a palace or castle hotel, or celebrate the end of winter during Moscow's Maslenitsa Festival. However, you'll need to book your travel in advance as these venues are extremely popular. 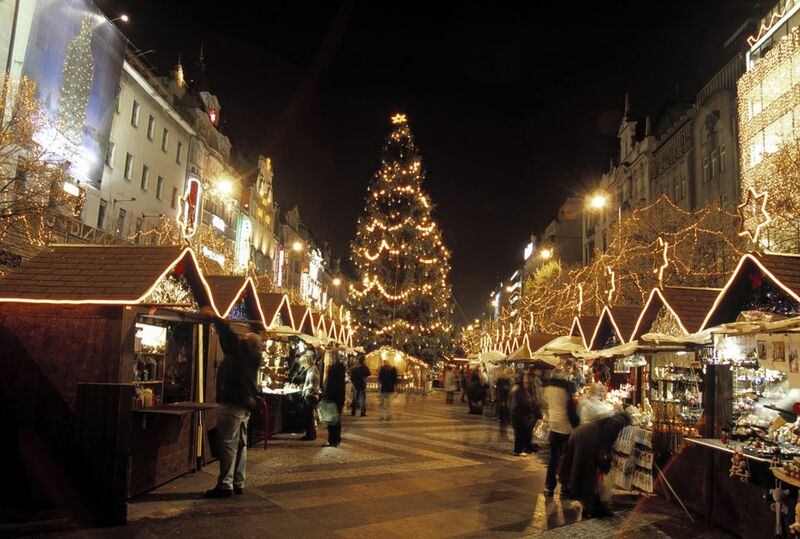 Eastern Europe's Christmas markets, which begin at the start of December and end at the beginning of January, are reason enough to brave the cold and visit the region during this season. Here, you'll be able to buy gifts, souvenirs, decorations, handicrafts, and foodstuffs traditional to the season and browse in an environment lit up with multi-colored lights and fresh with the fragrance of pine from holiday trees and fir boughs draping market stalls.